Exciting new opportunities for greater proliferation of robotics in modern society are emerging all the time. Robots are now capable of performing a wide array of different tasks. They are revolutionising the factory floor by dramatically boosting production throughput. In the form of collaborative robots (or cobots), they can work directly alongside humans in manufacturing facilities, as well as helping with the education of our children and providing care to the elderly. Upholding the highest possible levels of operational reliability is, of course, paramount. 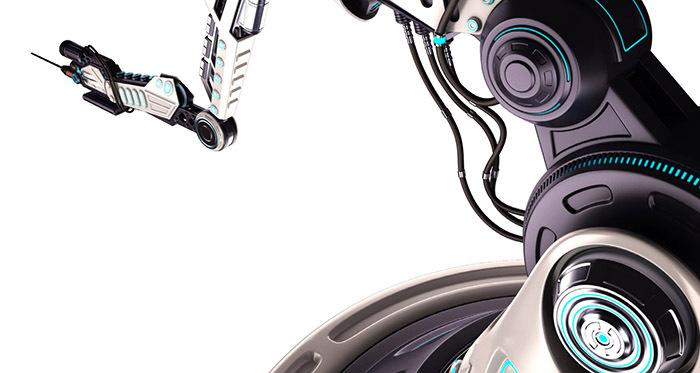 Though robotic designs can be increasingly intricate and sophisticated, assuring reliability is maintained needs to be done right down at the component level. Every robotic system is dependent on the delivery of power to drive the motors and actuators that enable its movement, plus the transportation of data from integrated sensors that allow it to respond to and interact with the surrounding environment. Connectors and cabling therefore have an important role to play. Despite large quantities of money being spent on robotic system construction, when it comes to purchasing constituent connector components, engineers and procurement managers often simply go for commodity connectors from computer hardware suppliers. The perceived cost savings are misjudged though. 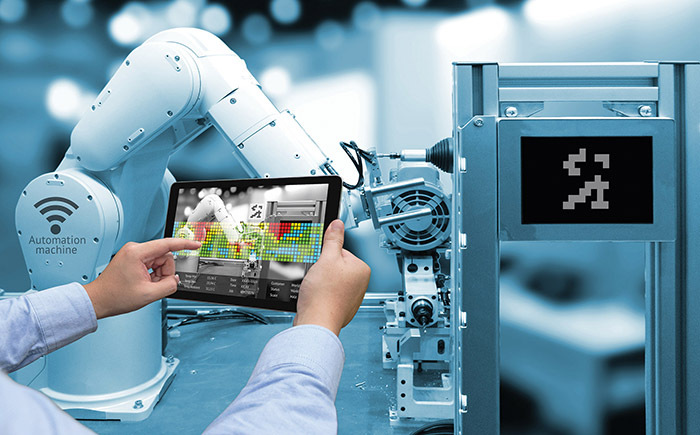 Down-time through connection failure can have heavy financial impact – with the production line in which the robot is situated remaining inactive while the cause of failure is identified and repairs undertaken. Specifying high reliability (hi-rel) connectors and accompanying these with well-constructed cable assemblies means that such situations can be avoided. How can Harwin help with implementing robotic designs? Harwin offers a range of hi-rel connectors, capable of coping with the most uncompromising of application settings – where exposure to shock, vibration and extreme temperatures are commonplace. They are backed up by a cable assembly service, which allows customers to offload this difficult and problem-fraught work onto its experienced engineering team. Harwin has no minimum order quantity for its cable assemblies, so they can therefore be sourced in a cost-effective manner with just the required number of units being paid for and no upfront tooling costs to worry about. Backpotting is also offered as part of the cable assembly service package. Compact and lightweight, but still also rugged, the company’s Gecko-SL 1.25mm pitch connectors are optimised for high density electronic deployments where available space is limited. Their robust construction and stainless steel screw-lok mechanism protects them from elevated levels of shock (50g) and vibration (20g/2000Hz). Furthermore, a -65°C to +150°C temperature range is supported. Each of the beryllium copper plated contacts have the capacity to deliver 2A of current. The M300 Series range is a low profile 3mm pitch hi-rel power components feature a four-finger contact design that maintains connection integrity regardless of high levels of vibration and shock. The current rating is 10A per contact, with three-contact single row, plus six-contact and ten-contact double row arrangements available. A 1,000 mating cycle durability is supported. 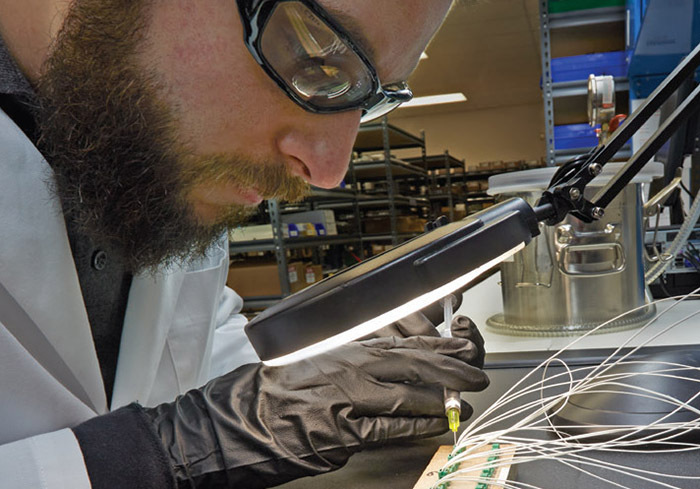 Mix-Tek – Harwin’s Mix-Tek product offering combines power and signal connection, in order to save valuable space within densely-packed electronic designs, such as robotics. The power contacts are rated up to 40A, while the signal contacts have a 3A rating. The connectors can accommodate up to power contacts and up to 12 signal contacts, with a wide array of different options covered. There will be a certain level of holding force keeping the contacts in the connector housing once assembled, but this is limited. Complex and often repetitive movements, such as the ones that industrial robots will be continuously executing, expose the connectors/cabling to numerous mechanical stresses over their operational life. Consequently, adequate strain relief needs to be provided to mitigate the effects of torsion, etc. Backpotting is often employed in heavy-duty designs (including robotics) for strain relief purposes. Here, a potting compound (normally an epoxy resin) fills the area at the rear of the cable connector to bring an extra robustness to the assembly. Firstly, it should be determined if there is a retaining wall on the rear of the connector. If so, no extra tooling will be required to retain the compound whilst it is in a liquid form. If there is no retaining wall, then can some sort of hood or backshell be fitted? It might be possible to fit the hood and then completely fill up the inside of the hood assembly with the backpotting compound. This will depend on the hood design, whether it has any holes or is a close fit to the connector, and if the potting might interfere with jackscrews or other mechanical elements. If there is no wall, nor a hood, then it will be necessary to build a temporary wall around the rear of the connector, to retain the compound whilst it is setting. This can be achieved with something as straightforward as standard masking tape. Once the compound has solidified, the temporary wall can be removed and the resulting backpotting will be strong enough to not require further support. Are all the contacts going to be wired up? If not, it will be necessary to populate every contact, or use a dummy contact arrangement for those not populated – otherwise the liquid compound will flow out through empty holes in the housing. Thought will need to be given to the actual design of the crimp contacts, as some contacts will have a very open design with no means of keeping the liquid compound at the rear of the contact. These designs are more common with open crimps on basic PCB connectors and are thus not suitable for backpotting. Once the backpotting has been applied, and it is in the process of setting, it is vital to keep the connector mated to another connector, so that the contacts are properly aligned within the housing when the compound hardens and they can no longer move. Cable contacts have a certain amount of float whilst being assembled and there is a risk of contacts getting permanently fixed at an angle. This will make wear more acute in a particular spot and increase the required insertion force – potentially leading to early failure arising. Create a potting wall if required. Use a fixture to hold the connector steady. The simplest fixture is to glue a mating connector to a rigid board and mate the connector being potted. Alternatively the connector could be held in a small vice – it is recommended that the connector is still mated in these methods. Mix the epoxy compounds (resin and hardener) to the manufacturer’s specification – not too vigorously, to minimise the presence of air bubbles. Load the mixed epoxy into a syringe or dispensing system, with the appropriate nozzle size for the application. In situations where a small applicator nozzle is employed, a powered dispensing system may be needed. Dispense the amount needed to fill the area. If required, use a vacuum environment to de-gas the dispensed fluid – thereby removing trapped air bubbles. Place the assembly somewhere safe whilst the epoxy compound sets. For some resins, heat curing may be necessary. Once the assembly is set, remove any material used to create a temporary potting wall and inspect the completed product.